Would you scramble up a five-story tower, climb into a harness, clip onto a metal cable, and fly through the jungle? Would you walk into an eerie cave to snorkel in an ancient river? I never thought I would. But I did. “From this moment, your life is in my hands. Do you ever want to see home again? Be nice to me,” kids our guide Maneli Rivera. 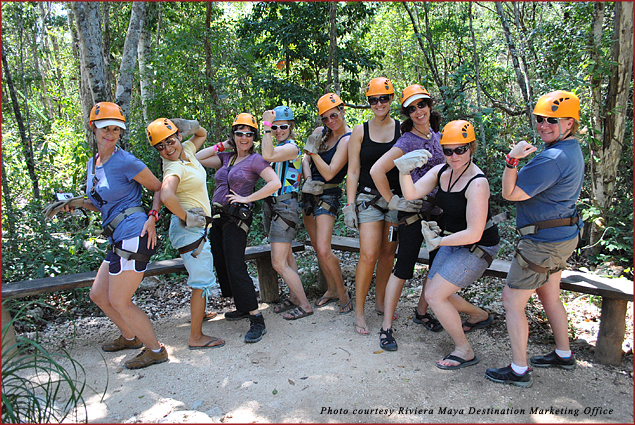 Our intrepid group is spending the day with Aventuras Mayas, a tour company offering “Xtreme Over the Edge” zip line experiences in Riviera Maya near Cancun, Mexico. Outfitted in harnesses, helmets, and gloves, we trudge up the stairs of a five-story tower. We learn how to properly grasp the cable, and then sit back in the harness, legs flexed forward. Seeing vast green jungle stretching to the horizon, my heart freezes. “Do I really have to jump off this platform?” I implore the zip line operator. “Si, senora, now!” Before I can bid farewell to my friends, I’m zipping through a green blur. Screaming and smiling. “How do I stop?” I wonder, as mercifully, the cable brake slows me down. I step into the arms of a handsome guide waiting at the next tower. Can we go for cappuccino now? No, two more towers must be climbed for two more thrilling jumps. All this jungle flying is not so bad. I’d do it again. Next, our fearless leader Maneli leads us into a dimly lit cave to swim in a cenote, a chilly underground river meandering in every direction. “Put on your mask and snorkel and follow me. Be careful – don’t crash your lovely faces into the stalactites overhead.” Obedient mermaids, we’re awed by the mysterious canyons below our masks. Maneli lures us out of this amazing underground river with promises of barbecued chicken and spicy salsa waiting in the picnic tent. We’ve soared over the jungle, and snorkeled an emerald river deep inside a cave. So far, our extreme journey is awesome. We’re ready for a restful night and dinner at our hotel, the Xpu-Ha Palace Resort, an ecological park/sanctuary and luxury hotel. We amble through lush tropical jungle, visiting creatures in their habitats: flamingos, turtles, alligators, spider monkeys, and deer. Green iguanas and brown long-tailed coatis follow us along the trails. The aviary is a happy universe of rescued macaws, parrots, toucans, and ducks, chirping and whistling. My favorite animal is a margay, a small black spotted cat that looks like a baby jaguar. 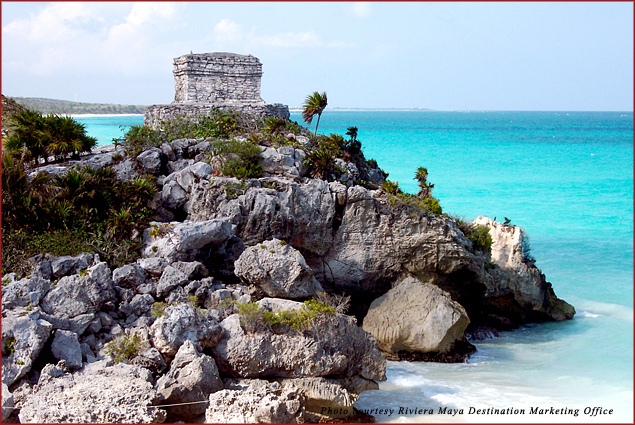 Riviera Maya is home to five species of wild cats – jaguars, pumas, jaguarondis, ocelots and margays. 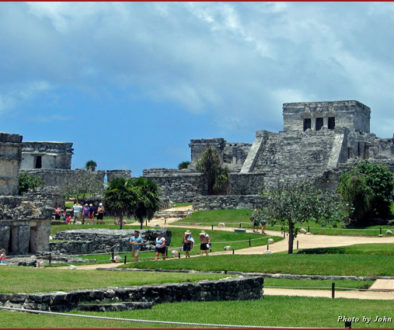 The Mayas worshipped felines and considered them sacred powerful forces who protected humans in the manifestations of sun, sky and stars. All these wild cats are endangered, but protected by Mexican law. 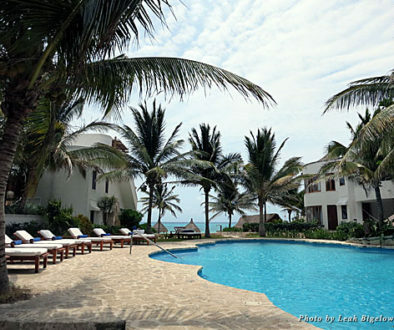 Fortunately, the Xpu-Ha Palace Resort is a favorite vacation resort for people too. My spacious high-ceilinged bungalow has two huge beds, two sinks, a stocked refrigerator, a coffee maker, a TV, a fan, air conditioning, an oversized Jacuzzi, and a shower. My balcony and hammock overlook the deer sanctuary. I can order room service 24/7, and all food and cocktails are included in my room rate, so when I’m not enjoying the pools, beach, or boutique, I’m blissfully watching exotic birds flit around my balcony, as deer babies in the sanctuary below nuzzle their moms. A hotel cat even drops by to finish my chicken dinner. 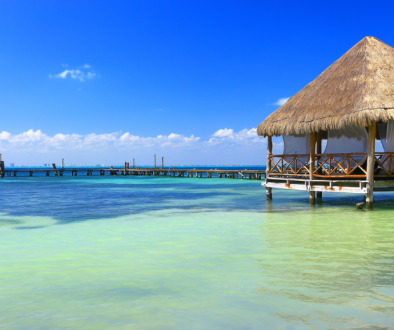 Macaws, margays and margaritas, what’s not to love at this eco-friendly resort? The third-largest natural protected area in Mexico, and a UNESCO World Heritage Site, the Sian Ka’an Biosphere Reserve is a wonderland of mangroves, jungles, wetlands, savannahs, and coastal lagoons on 1.3 million acres of tropical ecosystems in the state of Quintana Roo. The reserve is home to 800 plant species, 350 bird species, as well as jaguar, puma, ocelot, spider monkeys and crocodiles. On our jungle tour, Antonio lectures about the flora and fauna, temples and archeological sites, and nearby Mayan villages. Antonio leads us along a boardwalk through the dense forest to a stunning blue lagoon. Under shady trees, the Sian Ka’an Community tour guides serve us a delicious lunch of tamales and fresh fruit. Refreshed, we climb into boats and speed across the shimmering water, veering around emerald mangroves, to a dock where guides offer us life vests. Legs and arms outstretched, the shallow turquoise river gently floats us among giant mangroves. Fish kiss our toes. A cobalt sky beckons us to dream. All we have to do is float towards our next adventure, which of course will be exhilarating. Aventuras Mayas offers challenging adventures, like ziplining, rappelling, cenote/cave exploration, snorkeling with sea turtles and tours of Tulum. 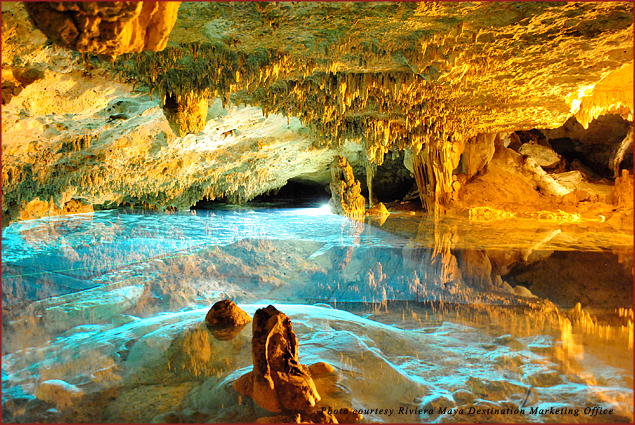 Visit one of Riviera Maya’s most amazing natural wonders, Rio Secreto, a cavern of ancient stalactites and stalagmites and an underground river. Expert guides lead you on an unforgettable hike and swim. All gear is provided.